The 5057 Project has been quiet this year. 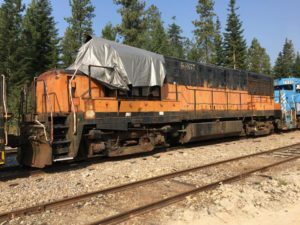 Our initial plan when we took the locomotive to the Pend Oreille Valley Railroad (POVA) shop in Usk, WA was to have them work on the locomotive between other jobs. Fortunately for the folks at POVA, they’ve been extremely busy! The 5057 has only been in the shop once since it arrived. We recently talked to our friends at POVA and they told us they’d like to bring the 5057 into their shop and do all the cosmetic restoration work at once, including the painting. They anticipate having an opening in their schedule next spring. We have the funds on hand to finish all the work to prepare the locomotive for painting, but we need to raise about $20,000 to cover the actual paint work. This means we need to kick our fundraising into high gear. Our goal is to have the funds raised by the end of March 2018. 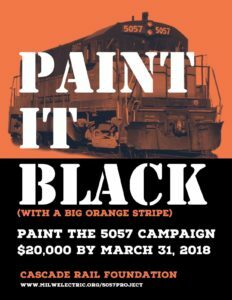 We invite you to sponsor the painting of the 5057. Dividing the cost of the work to be done by the approximately 45 gallons of paint and primer needed, a $505.70 donation will cover a gallon of paint. A $100 donation will cover about a quart. And a $50.57 donation will cover about a pint. No, we aren’t paying $500 a gallon for paint! The paint we’ll be using is expensive, but the $500 includes all the labor and other materials needed for a high quality paint job. Please consider making a donation today at any level to help cover part of this work.